Picture this: desecrated landscapes and historic heritage sites that are forever lost to future generations due to industrial pollution and environmental degradation or a world without the romantic charm of towns such as Venice, captivating water ways such as Egypt’s Nile or the rich, green rolling hills of northern England and Ireland. A growing number of painters and and other artists concerned about our vanishing landscapes are finding creative ways to not only marry art with environmental protection, but are also using workshops to bring an artistic appreciation of everyday landscapes, historic towns and cultures to people who seek to explore and capture the world around them. The J. Paul Getty Museum of Los Angeles traces the history of landscape painting to ancient Greece, where local artists would use walls as their canvas, in order to capture both gardenscapes and landscapes. While during the Middle Ages, landscapes were rarely painted on their own (they were instead simply used as backdrops for religious depictions), the 1500’s saw a growing interest in painting the natural world for its own beauty, with the concept of landscape painting first developed in the Netherlands. With the advent of both the Northern and Italian Renaissance, people began commissioning and purchasing secular art, which opened up a new interest in landscape painting. The industrial revolution of the eighteenth century caused supporters of romanticism – namely, artists, writers and thinkers who emphasized humanity’s connections to the natural world – a great deal of consternation, but certainly nothing like the contemporary concern by those close to today’s environmental movement, as they witness the impact of decades of neglect in the field of conservation. This sparked the development of international groups such as the Artists for Conservation (AFC), which allows artists of all stripes and backgrounds to marry their interest in capturing the natural world around them with their efforts aimed at preserving the landscapes that often serve as the very inspiration for their art. The AFC also raises awareness of conservation by maintaining a gallery focused exclusively on paintings and other form of art inspired by natural landscapes, wildlife and biodiversity. Once a powerful, independent maritime republic, Venice gradually transformed from a political powerhouse in southern Europe to a leading center for artistic expression, starting The Metropolitan Museum of Art notes that the guild system was especially strong in Venice, allowing many more artists and artisans to become involved in painting and in other artistic crafts. The Venice cityscape and landscape was always a central element of this art and it inspires artists to this very day, but environmental concerns surrounding the growing presence of cruise ships and the subsequent pollution raised the question of whether future generations of artists will have the same opportunity to capture the beauty and charm of Venice on their canvas. According to a report by Iglu Cruise, new legislation restricting and then eventually banning cruise ships from Venice is one way that local council is trying to preserve the region’s landscape from the pollution caused by the arrival of ships weighing over 40,000 tons into the lagoon. This legislation, however, is being challenged and Italian courts will have to weigh the importance of preservation vs. business and tourism industry income. Although the cruiseship industry is trying to address its negative impact on the environment, some 25,000 gallons of sewage enter the world’s waters each day from these ships, showing that there is still much room for improvement and also underlining the rationale behind the initial decision of Venice lawmakers. The Nile Valley is a good example of what can happen to historic landscapes when local officials do not take environmental concerns seriously. Earlier this month the Egyptian government’s Minister in charge of waterways admitted that there is a significance problem with turbidity along the Nile Valley. This picturesque region of Egypt now has a river running through it with a distinctly brownish-yellow hue. According to the economic center for social rights, industrial wastewater has been flowing into the Nile for years bringing pollutants such as asbestos, mercury, sulfur, oil and arsenic into Egypt most famous river. Officials at the center are concerned that the Ministry of Interior is simply not implementing laws nor enforcing existing legislation that would protect the local landscape and environment along the Nile Valley. With 20 million people living along the Nile, spread across 43 industrial towns, the lack of effective environmental protection may soon cause permanent damage to one of the world’s most enchanted landscapes. The contrasting approaches of Venice and the Nile Valley show how to scenic regions of the world are handling the issues of preservation in such different ways. While there is much work to be done along the Nile and although artists in Venice will no longer be able to paint cruiseships entering the lagoon, forward-thinking lawmakers and artists who are concerned about the environment can at least ensure that enchanting landscapes can find their way onto the canvases of a future generation of artists. Last weekend we attended the WSO Convention in the Portland Area. 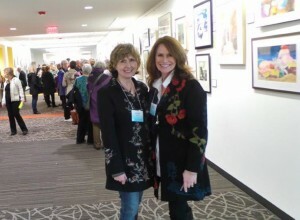 We found the meetings, art show, lecture and awards banquet to be very inspiring. 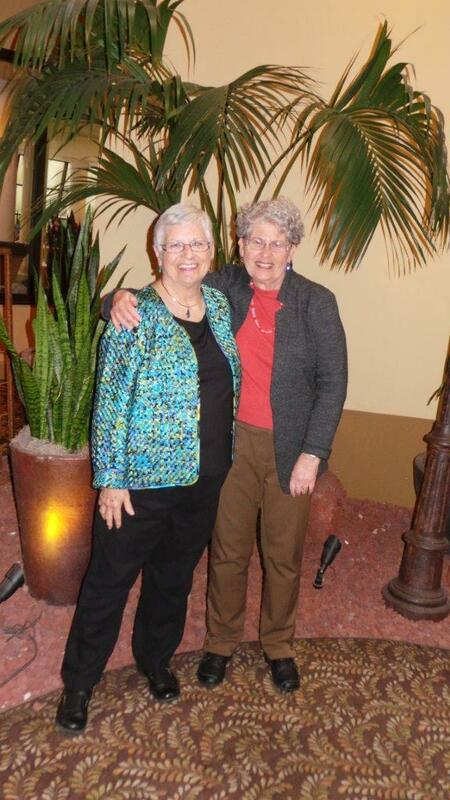 Our new friends pictured here – Elaine Deharpport & Diane Thramer truly inspired us with their stories of long time friendship. Friends since elementary school, these women are an example of enduring friendship. Art is such an individual pursuit, we are grateful to be the kind of friends that encourage and support each other along the way. Save the Dates for Daniel Smith in March! We just had a wonderful talk with Deb at Daniel Smith, and we’re collaborating on some projects to share our travel tips and painting ideas. Watch for more to come. 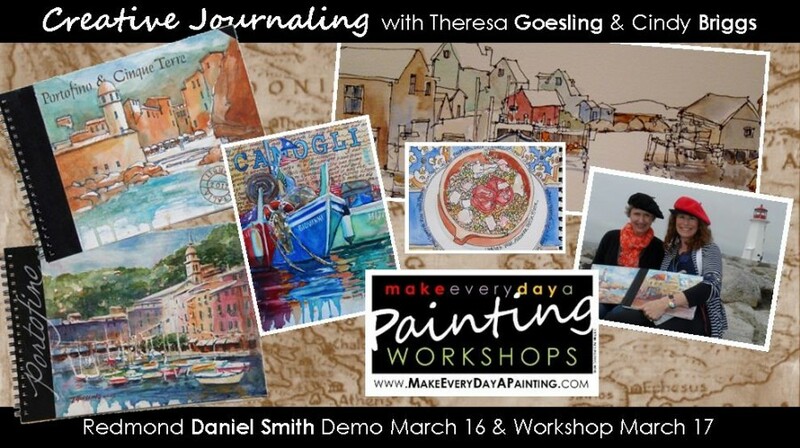 Join us in March at Daniel Smith as we share great ways to travel and paint, along with Watercolor Tips & Tricks for the Studio and en Plein Air. See below for dates and locations. 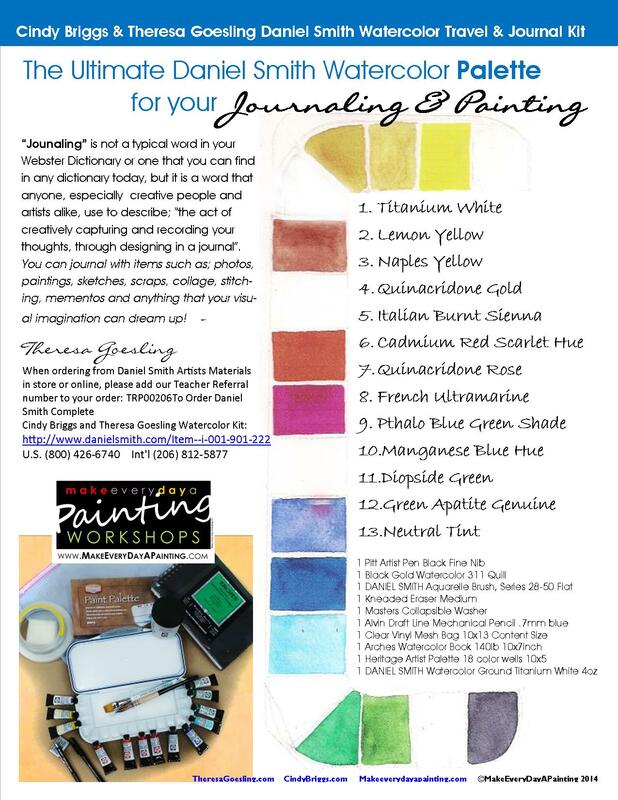 Click on journal photo below to order your Cindy Briggs & Theresa Goesling Daniel Smith Watercolor Travel Journal Kit! Daniel Smith FREE Demonstrations Save the Dates for Daniel Smith Demonstrations & Workshops with Cindy Briggs & Theresa Goesling. Enjoy a 1 hour demonstration as the dynamic duo enthusiastically share their adventures in watercolors. March 15 – Watercolor Tips & Tricks Demonstration Seattle Store 11 & 1:00 (Learn how to Fix, Fine-Tune and Finish your painting in the studio and on location) FREE March 16 – Watercolor Journaling Demonstration Bellevue Store 12 & 2 FREE March 17 – Creative Journaling Workshop $90 Redmond Store 10:30 to 3:30. Learn creative, artful ways in watercolor and mixed media to record your journey. Call 4250-643-1781 to register. It’s January and we need to find some sunshine. Learn how to capture sunbeams with a paintbrush in your hand. From simple to complex we will get your New Year’s painting jumpstarted. Join us for some free demonstrations and a fun workshop on January 15. 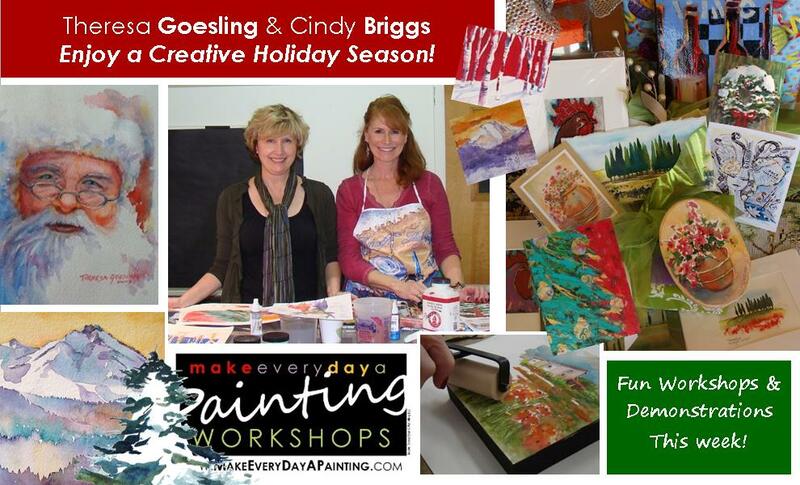 Save the Dates for Daniel Smith Demonstrations & Workshops with Cindy Briggs & Theresa Goesling. 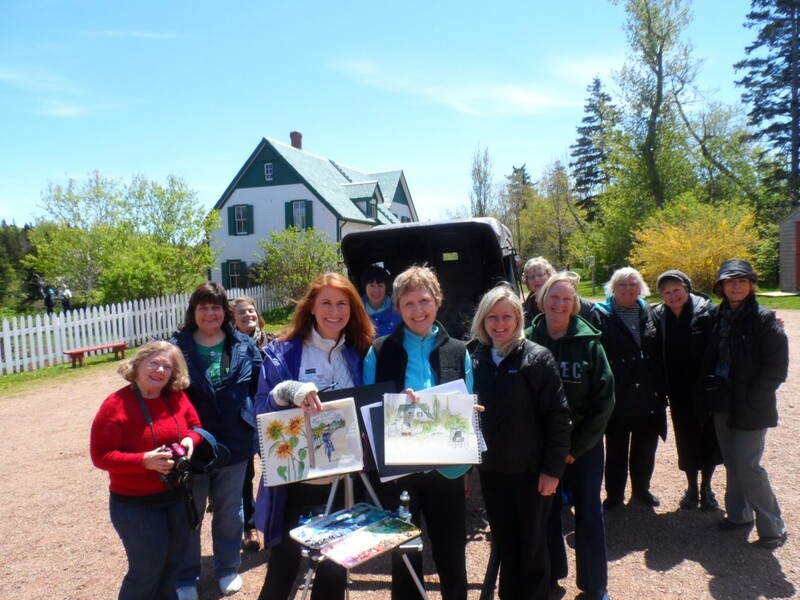 Enjoy a 1 hour demonstration as the dynamic duo enthusiastically share their adventures in watercolors. 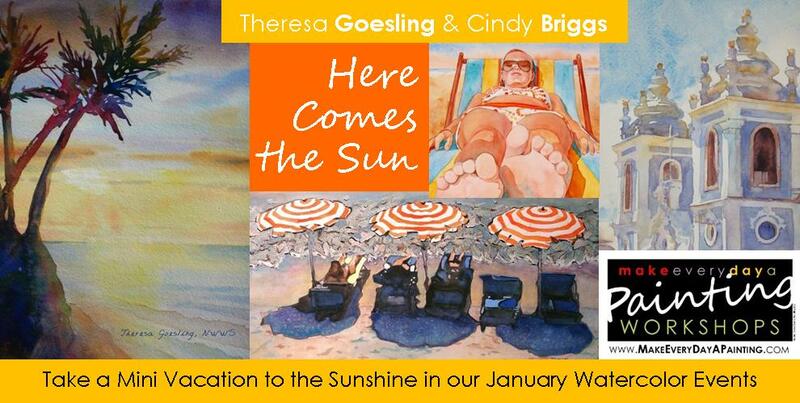 Wednesday, January 15, Let the Sunshine In Watercolor Workshop at the Goesling Gallery on Mercer Island. email: MakeEveryDayAPainting@yahoo.com to sign up. Supply list provided. Limited to 10 students.